A maar is a low-relief, broad volcanic crater formed by shallow explosive eruptions. The explosions are usually caused by the heating and boiling of groundwater when magma invades the groundwater table. 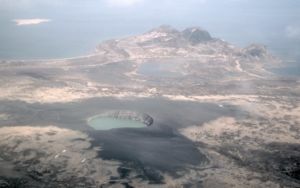 Maars often fill with water to form a lake. This page was last modified on 3 October 2007, at 21:33.